Blurb: Brimming with swords, sorcery, and wit, Orconomics: A Satire introduces Arth, a world much like our own but with more magic and fewer vowels. For the licensed wizards and warriors of Arth, slaying and looting the forces of evil is just a job. The Heroes’ Guild has turned adventuring into a career, selling the rights to monsters’ hoards of treasure as investment opportunities. Corporations spend immense sums sponsoring heroes to undertake quests, betting they’ll reap the profits in plunder funds when the loot is divvied up. Questing was all business for famous Dwarven berserker Gorm Ingerson, until a botched expedition wiped out his party, disgraced his name, and reduced him to a thieving vagabond. Twenty years later, a chance encounter sees Gorm forcibly recruited by a priest of a mad goddess to undertake a quest that has a reputation for getting heroes killed. But there’s more to Gorm’s new job than an insane prophecy; powerful corporations and governments have shown an unusual interest in the job. Gorm might be able to turn a bad deal into a golden opportunity and win back the fame and fortune he lost so long ago. Promising fun, fantasy, and financial calamity, Orconomics: A Satire is the first book in The Dark Profit Saga, an economically epic trilogy. Get ready and buckle in, fam. It’s time to review the second SPFBO Finalist I’ve read, Orconomics by J. Zachary Pike, and I got some notes I need to try to form coherently into a review, so let’s see how well I can manage it. 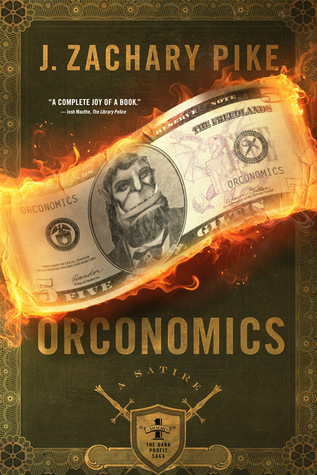 Orconomics is a beyond clever story that romps on the classic fantasy tropes and thrives with humor and is influenced by DnD heavily (in my opinion; obviously, I can’t speak for the author or his intentions, but I feel pretty confident in this claim). I think this story is perfect for fans of Kill the Farm Boy by Delilah S. Dawson and Kevin Hearne (seriously, if you enjoyed one, you have to read the other). And I can totally see why this is a finalist in this contest. It’s well written, there were plenty of moments that made me laugh and the characters surprised me in how attached I actually got to them. You see, like Kill the Farm Boy, this book relies–and in ways, thrives–on a certain type of humor that is always going to be hit or miss for readers. For me, and throughout most of this book, while I enjoyed it, I didn’t fall in love with it, and it leaned more towards the “miss” area. It’s simply not my kind of humor and I had a feeling that might be the case, going in. In the first half of the book, especially, I felt the pacing was a bit off in that I just wanted to get to the meat and heart of the story, yet it felt it took a little bit to get there. And while there were funny moments, awesome twists of phrases and some really awesome takes on old lore that I really enjoyed, I was thinking about this review and my score, and it was a general feeling of, “This is pretty good, but I don’t think I’m the right audience for this one.” I was leaning towards a 7/10. But then I hit the last hundred pages and my tune changed. Gorm made his decision. History pivoted on it. Perhaps it’s because the book got a tad bit more serious. Perhaps it’s because the momentum we’d been slowly building up to in the previous 600 pages was finally coming to a head. Perhaps it was because I finally learned the truth of what I couldn’t figure out and everything clicked and made sense, followed by a sense of dread as I realized what was going to result of that revelation. Prolly a combo of all three. But suddenly, I found myself invested in our heroes, invested in what was going on and I felt my heart tug a little as events unfolded. I couldn’t help give the book a higher rating than I originally planned, halfway through, because I enjoyed the ending so much and actually find myself wanting to know what happens next. That is the power of creating compelling characters, my friends. And I think that was my favorite part of this book. Sure, the humor didn’t always sit with me, the pacing felt a little off and I never really understood the economic chapters of the book, so that always pulled me out of the story (but damn if that wasn’t a seriously clever angle to write in a fantasy novel). But these characters did. I’m very partial to Gorm, though my favorites are Gleebek the Goblin and Thane, hands down. Some of the other party members, I wasn’t as attached to, but I did really love seeing the growth of all of them, seeing how the party came together, their comradery building; some of their conversations and banter towards the latter half of the book was some of my favorite bits throughout the entire thing, and it was really hard not to root for them and read the last 100 pages in quick succession, by the end. So overall, I enjoyed this and I think I’ll be picking up the sequel at some point, because I’m curious to see where it’s headed. It’s ridiculously clever, definitely funny (especially if this humor hits home with you more than it did me), but with a heart to the story that, while it might take a bit to truly connect with you, really hits home when it does. I love when a book turns around for you and you end up loving it! Not sure this would be my kind of humor either, though. I liked Kill the Farm Boy… I’ll check this one out! Thanks for the review. Yes, if you enjoyed that one, I seriously think this will be right up your alley! I can’t wait to see what you think, if you read it and decide to review it. It sounds like my sense of humor because I even laughed at the blurb! You should totally give it a try! This is on my Kindle and I keep debating starting it. Not sure when I’ll get to it yet though. I’ll definitely be curious to see what you think, if you do read it! I hope you enjoy it, whenever time allows you to read it! So I would assume that a lot of the humor is scatological based on the comparison to kill the farm boy? If so then this might not be the book for me even though the blurb sounds funny.